As soon as the pressure, push, fuss (feel free to add one of your very own adjectives here) of Christmas is over with, everyone starts in with yet another really stressful tradition – the New Year’s resolution. There are many statistics out there about New Year’s resolutions and many of them show that less than half of these make it to June. So why do we even bother? Why do we feel the need to remake a part of ourselves every year? All that ends up happening is more self-loathing after the inevitable failure results. So, if you’re really into having a great experience of failed expectations then go ahead, make those New Year’s resolutions. 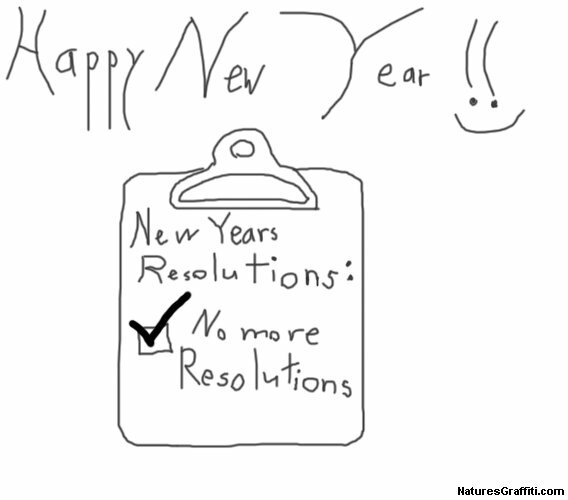 From a non-dualist perspective, the typical New Year’s resolution is like finding a job instead of a career, which is a really bad idea. The focus of awareness is narrow, limited and never satisfying. When we do this, we are telling ourselves that we should be something other than what we are: that we’re not good enough as we are. The social media, flagrant with consumerism, fuels and manipulates these feelings of inadequacy. What we need to remember is that New Year’s resolutions are based in duality. They put our attention on the ego (personality) and take it away from what is real. The result is that we pour all of our energy into the ‘window dressing’ while losing sight of the truth. So relax, toast 2011 with no expectations. If you must make a resolution, make it one of switching your focus off the ego and onto bringing more love into your awareness.